Coherent light-matter interaction in semiconductor quantum dots (QDs) is receiving increasing attention due to possible solid-state implementations in the emerging field of quantum information processing. Beside its fundamental interest, the knowledge of the dephasing time, inversely proportional to the homogeneous broadening, of an excitonic transition in a QD is of crucial importance for these applications. The dephasing time sets the time scale during which the coherence of the excitonic transition is preserved and therefore operations based on coherent-light matter interaction can occur. Moreover, it is strictly related to intrinsic mechanisms such as radiative processes, carrier-phonon scattering and carrier-carrier scattering. 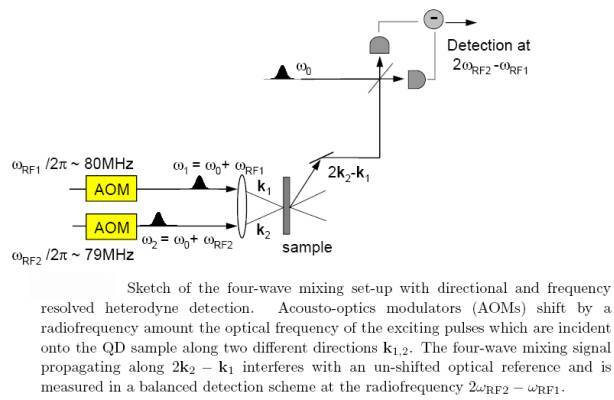 Its study is a direct probe of those carrier dynamics which ultimately are limiting the high-speed performances of QD-based lasers/amplifiers. Among the physical mechanisms responsible for the dephasing of the excitonic polarization QDs, the interaction of excitons with phonons is a topic intensively discussed in the literature. 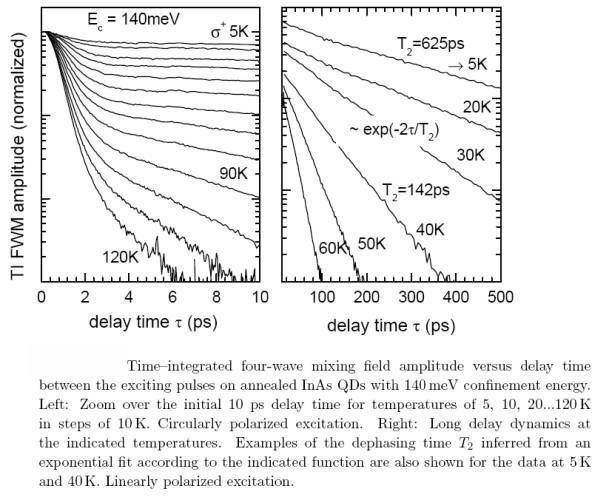 Using a sensitive four-wave mixing technique in heterodyne detection we measured a non-exponential decay of the optically-driven polarization in epitaxially-grown InGaAs/GaAs QDs at low temperatures, consisting of a fast initial decay over a few picoseconds followed by a long exponential decay over several hundreds picoseconds eventually limited by the radiative lifetime in the few nanosecond range . The corresponding non-Lorentzian homogeneous lineshape in spectral domain has stimulated a number of theoretical works and is interpreted in terms of a narrow zero-phonon line superimposed to a broad band from exciton-acoustic phonon interactions due to the local character of the electronic excitations in QDs giving rise to a local lattice distortion . A clear understanding of the physical processes governing this unusual dephasing is of fundamental interest and of key importance to predict and control the decoherence for applications of QDs in quantum computing. P. Borri et al. “Ultralong dephasing time in InGaAs Quantum Dots”, Phys. Rev. Lett. 87, 157401 (2001).